CBD Oil Review rates Sunday Scaries CBD with two stars because it qualifies for the Quality & Mission Badges. The term ‘Sunday scaries’ has been around for a few years now, used mostly among partying young people. It describes the anxiousness faced by those who partied too hard and spent too much over the weekend and are consequently mentally and physically feeling the effects. 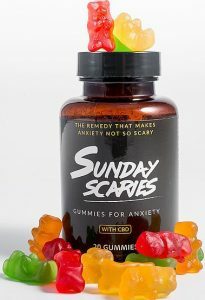 It’s somewhat of a cultural phenomenon of specified anxiety, and a CBD company aptly named Sunday Scaries has brilliantly marketed themselves as the antidote. 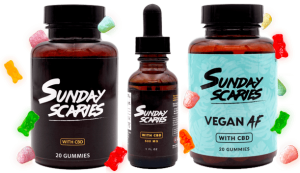 Sunday Scaries founders Beau and Mike initially created CBD gummies for themselves to ease the apprehension of their ‘professional, moral, and financial hangovers’ and ‘impending doom of Monday’ after weekend blowouts. Before they arrived at their gummy formulation, they had experimented with other forms of CBD, but found issues with prices and dosing. They therefore decided to bring an approachable, affordable CBD oil product to market to cure the Sunday scaries everywhere. “The remedy that makes anxiety not so scary.” That’s the motto, and their marketing efforts are focused almost exclusively on CBD’s purported benefits in combating anxiety. The industrial hemp used in their CBD products is grown under organic protocols on U.S. farms in compliance with the 2014 Farm Bill. They utilize CO2 extraction, earning points for quality and sustainability. The product line is very basic, featuring CBD tinctures and their flagship gummies as well as bundles and subscriptions of said items. Both the CBD tinctures and gummies contain D3 and B12 as added active ingredients with beneficial properties for enhancing mood and energy, respectively. The Sunday Scaries tinctures contain all-natural, quality ingredients we approve of. The CBD gummies are split into two segments: regular and ‘Vegan AF’. And here’s where it gets confusing. The regular, flagship gummies contain no artificial ingredients but include gelatin, a substance comprised of animal proteins and peptides. Their Vegan AF gummies, though free of animal products, contain artificial colors and flavors. These also have an added ingredient of full spectrum nano CBD in addition to the non-GMO CBD oil present in both varieties. We have to ask, why use natural flavors and colors in one but not the other? This now involves a tradeoff for the consumer: if they want vegan, they must ingest potentially harmful artificial ingredients. If they want all-natural gummies, they won’t be vegan. And what’s up with adding full spectrum nano CBD to the vegan gummies but not the regular line? Finally, why not just make one line of vegan CBD gummies free of artificial colors and flavoring? Everybody wins. Unfortunately, we cannot award the Safety Badge as Sunday Scaries currently only has one CoA posted that does not include results for contaminants or residual solvents. The Charity Badge and Innovation Badge are amiss as well, since the company lacks any visible charitable engagement nor innovative practices. Bottom Line – We have to hand it to Sunday Scaries’ marketing angle. It’s pretty genius actually, and we’re convinced they will continue to grow in popularity. But we can’t help but wonder if a CBD business in the health and wellness space whose aim is to alleviate symptoms of an unhealthy, party lifestyle is perpetuating a bit of a duplicitous message. Sunday Scaries sources quality industrial hemp processed via CO2 extraction in the U.S. and combines it with D3 and B12 for additional natural benefits. 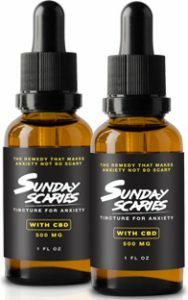 Sunday Scaries focuses on providing a natural, healthy, and affordable alternative for anxiety relief.